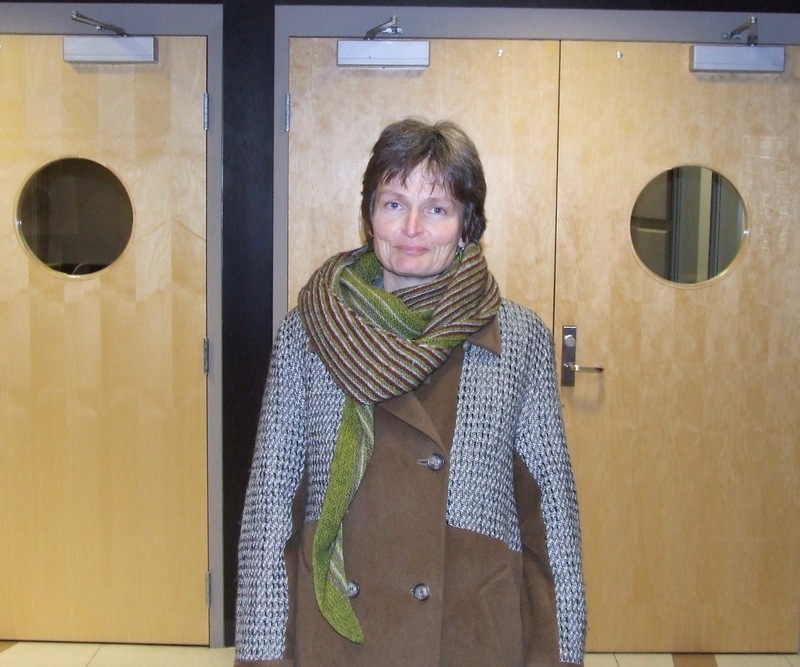 Sackville Town Council spent 40 minutes on Monday at its first April meeting hearing about and discussing what can be done to avoid the worst effects of climate change. The meeting brought forth warnings and pessimism, but also practical suggestions and hope. 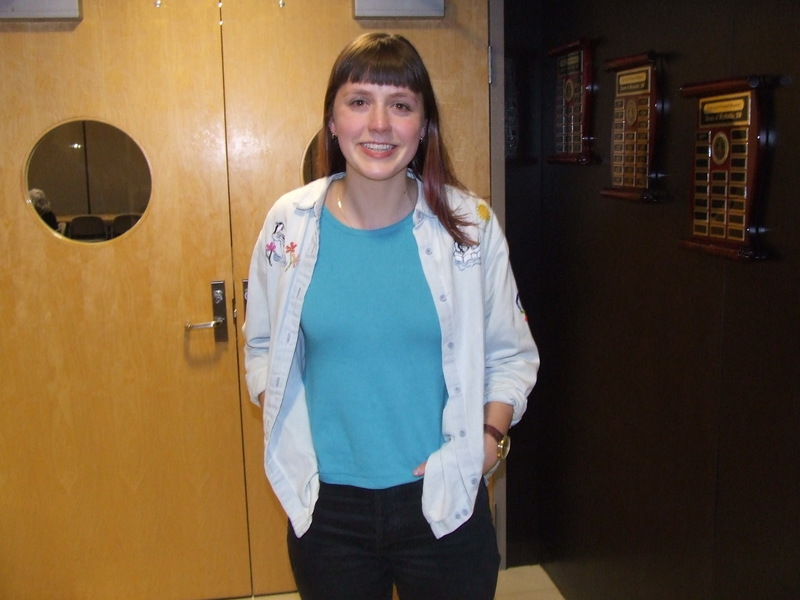 Some students, who skipped classes to march on Town Hall last month, listened as Sabine Dietz, a local environmental consultant, urged council to start thinking long term about protecting residents from the effects of rising seas, extreme storms and severe flooding. “Sackville is in a terrible location, we’re in a really bad spot,” Dietz said, adding that the world’s highest tides roll up the Bay of Fundy every day toward the town. Dietz referred to a recent news story which reported that the Chignecto Isthmus is only one “perfect storm” away from having its transportation links severed. “We’ve been really, really lucky that nothing has happened so far, but this is just a matter of time,” she said, pointing to dykes that are more than a hundred years old and that were not designed to protect built-up areas. Dietz called on council to adopt what she called a “climate lens” so that the inevitable effects of climate change are considered in all of its actions including adoption of the new economic development strategy that consultants have just submitted. Later during an interview, Dietz referred to council’s decision to allow a new ambulance station to be located on Robson Avenue as a prime example of failing to view municipal planning through a climate lens. She reiterated her concerns that ambulances could be cut off from both the town and highway during a severe storm putting local residents at risk. At the same time, Dietz acknowledged that if the town had refused to rezone the land to allow the station, Ambulance New Brunswick could have appealed that decision to the Assessment and Planning Appeal Board. But, she said, it’s important for local politicians to stand up to outside pressure from other levels of government when it comes to protecting their citizens from the effects of climate change. It was a point she made earlier in her presentation to council. Councillor Bill Evans served notice he would be presenting two motions at next week’s council meeting that striking students had called for during their march on Town Hall last month. “The first was to pass a motion, which is perhaps symbolic, but I think hugely important, and that’s recognizing that we are in a climate crisis,” Evans said, adding that he would also bring a motion forward to amend the town’s Sustainable Sackville plan in light of the latest UN report on climate change. She added it made her realize she is part of a generation that hasn’t done anything about climate change. Black went on to say he firmly believes “we’re doomed when it comes to climate change…I base my pessimism on my lack of faith in humanity,” he said. “Because people are too selfish or unaware of the change that each of us has to make to ensure a future for humanity, let’s face it, the Earth will remain, life will go on, just not including us. As dire as that seems, it’s the reality we face,” Black said. After a pause, Mayor Higham said no. 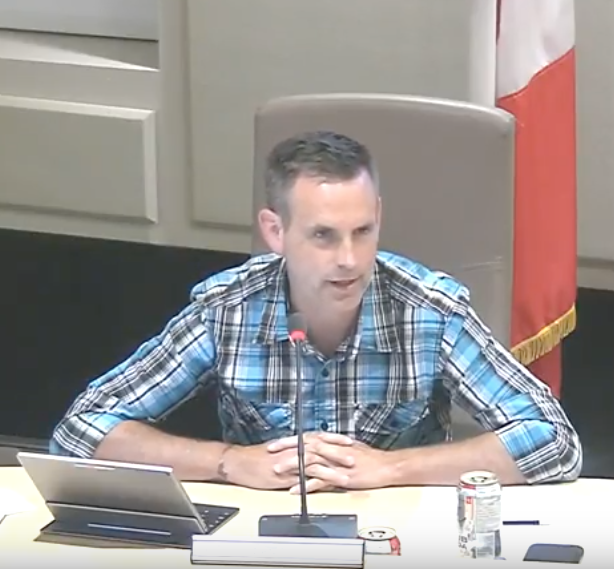 “Sorry, but no unscheduled presentations,” he answered, adhering to the rule that no one is allowed to make comments or ask questions at council’s first monthly meeting unless they’ve been approved in advance. Longard then left the council chamber clearly upset. She explained later that she had wanted to reinforce what Sabine Dietz said by calling on council for a commitment to act. “That is what I wanted to speak to in the context of clarifying that a climate emergency is not symbolic and as students, we’re not asking for a symbolic climate emergency,” Longard said. She repeated Dietz’s call for a “climate lens” to guide council’s actions. “Then it’s not just symbolic. All our policies going forward are responding to the climate crisis with the weight and the urgency that we need to,” Longard added. She also took issue with Councillor Black’s expression of deep pessimism about the likelihood of action on climate change. “When you say you’re a pessimist about climate change, you are saying no to our futures,” Longard said. “You’re saying to us that you don’t see we have a future and we’re saying that we still have time. “If you implemented the climate policies that we have come up with in different governments throughout the last 60 years, if those had been implemented and if we implemented them now and implemented stronger ones, we could find a way to create a liveable future,” she concluded. Longard also referred to Black’s suggestion that he would think twice about what it means to have children who face a dire, climate change future. Today, Longard sent a letter addressed to town council outlining the concerns she was not able to express during Monday’s meeting. To read it, click here. This entry was posted in Environment, New Brunswick politics, Town of Sackville. Bookmark the permalink. I also heard such comments from former graduates of Mount Allison University and other universities who are now in their mid-to-late twenties. Please think twice before taking drastic decisions that would mess up your fertility. As a 46-year-old woman who does not have children (after three miscarriages in a row), I have a piece of free advice to you and your friends (especially young women): No cause is worth such drastic decision, trust me. If you chose not to have children, make sure it is for a personal decision. Do not let anyone’s ideology dictate your personal fertility journey. Our ovaries know our biological age.Time will eventually fly. If the dykes are in such bad shape why not take the earth from the ponds and put it on the dykes to freshen them up and raise them up. Yes Gary, I would imagine that the excavated earth could be used to build out the needed width of the dykes on the fresh water side and then they could be topped up with shale to the required elevation. Who knows what their long term plans are as they are an extremely secretive bunch? They may just haul from the stockpile they have now created. Perhaps they will buy back the fill? Building up the main NB/NS dyke system is a future Federal project that we will have to wait at least two years for in order to see what they have proposed after they complete their $700,000 study. It will be quite interesting if that huge dyke project makes redundant most all the work that the Town has done. Thank you Bruce for sharing Miss Longard’s letter. A copy was finally delivered to my municipal email address at 9:21 am this morning April 3. So you definitely got the scoop on this story. I am available to help anyone navigate the processes put in place (which can be changed at the will of council) in order that their voice is heard. If at anytime Miss Longard or other citizens are looking to bring a message, question or comment to council, I would be happy to deliver that or put them in touch with the appropriate person to assist them. As I brought forward Monday evening when the agenda was being approved, the Mayor should be exercising council’s ability to hold more then 2 meetings a month when we have several topics that citizens wish to engage council on. There was too much on the agenda for one meeting to allow proper digestion of the information received and an appropriate amount of time for council to ask questions. Also I believe the opportunity to ask questions should be considered at the end of any meeting of council. I have raised this during the review of By-Law 251 Procedures and Organization of Council. I have done some research as to how the Town of Amherst conducts its monthly committee of the whole meetings and questions from the gallery. Their procedural by-law indicates that any councillor can ask that a person be recognized by council for a question, it would then need to be seconded, there would be no debate on the motion allowed and a vote would be taken. I hope that the town’s by-law committee will take into consideration a different way of conducting our municipal business and bring back to council some solid recommendations for improvement. Nice scoop indeed :). Thank you Councillor Mesheau for taking the time to write on this platform. I do not know how much all opinions of all citizens would matter here. Here is what I personally think and I heard it from at least two citizens since this morning: I do not understand why we need such a climate emergency measure declaration motion and why now? What are the implications of such a declaration, if any, now to our town? I will also add: Why the focus on this issue only, excluding other pressing issues such as poverty, lack of jobs, other environmental problems, etc.? As far as I am concerned, I am afraid such declaration of emergency may make us more prone to take emotionally charged decisions in the future. Is this a good coping strategy, politically and psychologically? Even scientifically? I cannot help but wonder, despite the significance of the climate problem. I have seen more imminent risks elsewhere (i.e. regional wars) in the world (e.g., Beirut, Lebanon). Not a single politician (or citizen) has called for an emergency declaration. Everyone calls for calm rather. Stability usually helps the economy and does not turn investors away. No need to reply, no worries :). Just sharing for the sake of sharing. I was in attendance at the Special Council Meeting on Monday and believe Councillor Black’s comments were misunderstood fully. My understanding was that he was in full agreement with what Sabine was saying just realizing that there is an uphill battle. I believe if you listen to him again you will understand the delivery of his words were simply different than how others express themselves. 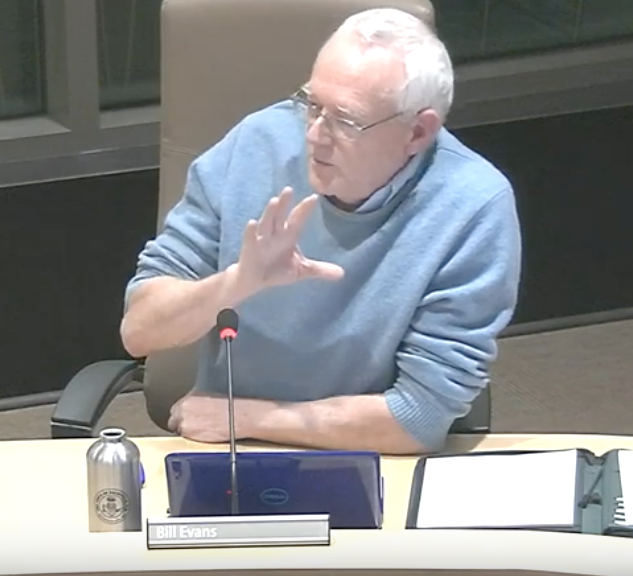 Additional comment from Bruce Wark: I have added the audio of the council discussion to my blog post. Click on the media player at the end of the section that is headed “Dire future.” The audio begins with Mayor Higham introducing the topic. Councillor Black’s comments begin at the 5 min. 13 second mark. Imagine if when you file your individual T1 income tax return every year, you had to pay a tax on the income tax. Meaning let’s say you paid $5,000 of income tax and then the government added another tax called the “income tax tax” and charged an additional 10% tax on the actual income tax itself. So you would pay $5,000 of income tax, plus $500 of income tax tax. Can you imagine any Minister of Finance ever daring to try such an outrageous plan? Yet this is exactly the situation we have with the carbon tax and the GST/HST applying on the carbon tax. It is utterly outrageous! Welcome :). Happy to read the post by the “People’s Party of Beauséjour”. All the best! I tend to be someone who gives to Caesar what belongs to Caesar. This is why, I will write the following: I am someone who has a long tradition of liberal voting (liberal values). I also know how to appreciate some of the achievements of the current Government (of course minus the Carbon tax!). Despite this, I also know to recognize talent when I see it. Mr. Bernier is a competent politician who has earned my respect. I think very highly of him and of his new party. I say this regardless of the outcomes of the next federal elections. Mr. Bernier speaks his mind genuinely and clearly in both languages. I have been following him for while now– since last spring or summer. He is transparent. I admire his tenacity. I also enjoy watching him siting next to “Madame” May (a lady I like/respect as well, even if I do not see the world through her lens :)). Sometimes, she does funny expression of horror when he speaks (e.g. on the carbon tax lately or something else before) and then when he sits down next to her, we can see both of them looking at each other amused (with reciprocal friendly smiles…. a nice TV moment). I heard him once say in an interview that they have lunch together every day. They decided not to talk politics and simply enjoy their meals, as colleagues. Another moment I appreciated was when I heard/read Mr. Bernier saying at a rally somewhere after a question about what he will do to this and that community. He said something like “I will not do anything for you because you are Muslim. I will not do anything for you because you are Jewish. I will not do anything for you because you are Christian. I will do EVERYTHING for you because you are Canadians”. This makes so much sense to me and to many of my “ethnic” Canadian friends in Toronto! I come from a family with 4 different religions (including the three ones mentioned above; even 8 if we count all the branches of Christianity). So, diversity, I know what it is in my own family and I say: the PPC got it right: Our unity as Canadians is our strength. I can draw a parallel with Lebanon during and after civil war. Indeed, in my opinion, it is the love of the country that kept and keeps Lebanese people united and their country in peace (despite their different ways of living sometimes or their different political views or loyalties). Mr. Trudeau is right on one part of the equation, I think: Diversity is our strength…but ONLY up to a certain point… Mr. Bernier got it right on: Our unity is our strength. Again, welcome :)– Best wishes!